Adner, Ron. The wide lens : a new strategy for innovation. Portfolio/Penguin, 2012. McQuivey, James. Digital disruption : unleashing the next wave of innovation. Forrester Research / Amazon, 2013. also in audiobook format. This review is the second in a series on new books on innovation. The first review is here. One afternoon twenty years ago, a large and energetic man burst into the Ford Library and, in a booming voice, asked for the book “that listed cool things that have not been invented yet.” This was years before publishers released the flood of new books about innovation. Today the library has a deep collection on the topic, and there is still no resource to answer the man’s question. Today’s review highlights two new books in the Ford Library collection, which provide a fresh perspective on what it takes to remain competitive through innovation. Ron Adner has been researching, writing and consulting about innovation throughout his career as strategy professor at Dartmouth. In The Wide Lens, he explains that not all great innovations become successful. An exceptional company may identify key customer needs, deliver a first-class product and beat the competition to market, yet in the end, the innovation may fail. Adner argues that companies need to understand that even with perfect customer insight and flawless implementation, success in innovation also depends on partners who may also need to innovate and adapt in order for the innovation project to be successful. Adner calls his new perspective “a wide lens” and in his new book, he introduces a framework that exposes interdependencies, both overt and hidden, and he shows how to manage them. Innovating companies have always faced execution risk, the challenge of delivering a new product within specification and on time. But as the global business environment grows increasingly interdependent, innovators operate within a complex ecosystem composed of a matrix of partner companies, such as suppliers, distributors and retailers. Adner describes two additional types of risk that occur within the ecosystem, which he terms co-innovation risk and adoption chain risk. Much of his book is about identifying these risks, assessing the alternatives and mitigating the effects. To make dependencies in the ecosystem explicit, he outlines specific steps in creating a map or blueprint. This thoughtful and important book also provides many examples of successful and unsuccessful innovations with insightful stories from companies, such as Apple, Amazon.com, Michelin and Pfizer. James McQuivey is a leading analyst at Forrester Research and in Digital Disruption he explains that, in the digital environment, free and low cost tools are available that enable almost anyone to develop an innovation and become a competitor. In the traditional business environment, innovation arises among leading competitors within a particular industry. But in the digital environment, the barrier to entry is quite low and competition can come at great speed and from any direction, including companies outside the industry or from individuals worldwide. Even children with a few key digital tools at home can bring an idea to market, test it, refine it and disrupt a market. While the author references Clayton Christiansen’s book, The Innovator’s Dilemma, in the first chapter, “What is Digital Disruption?”, McQuivey does not define digital disruption clearly. To fully understand and appreciate this book, a reader needs this foundation. McQuivey outlines dozens of stories of successful digital disruptors throughout the book as he encourages the reader to adopt the proper mind-set, to invest cheaply and to generate ideas quickly. This short book is repetitive in places but readers already acquainted with digital technologies may find some new ideas. Our MMS students arrived earlier this summer, first year Orientation kicked off two weeks ago, and the second year MBA class have slowly returned to the library. As you arrive, you may have time to read a few titles that provide clarity to your qualities as an employee, a leader, a partner, or a parent. Keeping this in mind, the staff of the Ford Library as well as the Career Management Center contributed a few titles available on Kindles. You may borrow these Kindles from the Ford Library circulation desk by using your Duke ID. Stop by and borrow a few titles that might change how you see your life’s work. Thomas J Neff, et al, You’re in Charge: Now What? Nussbaum, Bruce. Creative intelligence : harnessing the power to create, connect, and inspire. HarperBusiness, 2013. Design professor and business journalist Bruce Nussbaum’s new book about creativity begins with an anecdote about Mick Jagger and Keith Richards. The story is about the development of their musical talent and it illustrates that creativity is less a stroke of genius than the natural result of years of study, the hard work of attention, listening to other people who are doing the same thing, working together and experimenting to generate something new. Similarly, Nussbaum’s study of design and innovation within organizations leads him to conclude that the hierarchical processes of most corporations dampens the social dynamics that foster innovation, such as serendipity, discovery and play. In his book Creative Intelligence, Nussbaum explains that creativity is not a rare genetic trait – it is a learned skill. People cultivate their creative ability by learning from others, collaborating and sharing. Nussbaum outlines five ways that people can become more creative including partnering with other knowledgeable people and by connecting different sources of information in new ways. Creative people have a playful mind-set and are more willing to take risks and navigate uncertainty without concern for failure. And many creative individuals, including artists and entrepreneurs, see their work as a calling. Their belief in their mission motivates them to work hard and their faith inspires others join their cause. Nussbaum shows how the organic messiness of some organizations leads to creative discovery. So it may be purposeful that this book is written in a disorganized style, almost like a conversation. The work contains interesting insights and engaging examples, but the writing is uneven. It becomes hard work to stay focused and to draw meaning from the text. Recommend with reservation. Welcome to our new students! And to our returning students, welcome back. 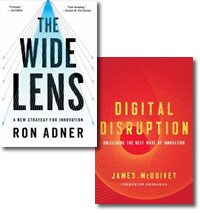 In celebration of those of you who come to Fuqua to remake yourselves, personally or professionally, or to deepen your existing knowledge base, or just to learn something new, I am reviewing 5 new books about innovation during the month of August. This week’s post reviews 2 new books on innovation written jointly by 2 faculty members from Dartmouth who often collaborate, Vijay Govindarajan and Chris Trimble. Both faculty members teach and consult about innovation and Govindarajan is sometimes ranked as one of the most influential management thinkers of the world, by those who measure such things. Reverse innovation : create far from home, win everywhere by Vijay Govindarajan and Chris Trimble. Under globalization, multinational firms export modified or low-end products to the developing world. But what works in the richer economies may not translate successfully in emerging markets, where customer needs are different. Innovation is often needed in emerging markets and occasionally these innovations create unexpected value for the developed world. Reverse innovation is the authors’ term for innovations that are first developed in the poorer parts of the world and later are adopted by rich markets. This book explains the theory underlying reverse innovation and provides guidance on executing successful reverse innovation initiatives, which may require new processes, new partnerships and a reinvented value chain. Case studies include Procter & Gamble, Deere & Company, GE Healthcare, PepsiCo and others. Also available as an audiobook. How Stella saved the farm : a tale about making innovation happen by Vijay Govindarajan and Chris Trimble. This simple parable about a farm in crisis uses animals as characters to ultimately illustrate eight principles for managing and executing successful business initiatives. More Who Moved My Cheese than The Goal, this 1-hour read shows how to build a dedicated team and to learn from disciplined experimentation. Also available as an audiobook.